Thursday will bring a “supermoon”, with the New Moon occurring at the same time as the moon is in Perigee (the closest its orbit comes to the earth). Larger than average tides accompany every New and Full Moon, year-round. But the added Perigee component means that over the next few days, our high tides will be much higher than normal, and the difference between high and low tides will be more extreme. Along much of the BC coast, these extreme tides will bring many more drift logs onto our shores. Remnants and escapees from BC’s forest industry, the logs are a hazard to boaters when they’re loose in the sea, especially when they’re in the form of “deadheads” – partially sunk, vertical poles that are virtually impossible to spot until you’re almost on top of them. And believe me, you really don’t want to land on one. Fortunately for boaters, high tides and winds can drive many logs up onto the beach, where some get stranded, at least for awhile – until the next extreme tide or storm pulls them out again, to drift about until they’re driven onto some other shore. The choicest logs might be collected by salvagers, but most are economically worthless by the time they settle on our shores – weather-beaten or riddled with teredo (shipworm) tunnels, like the log on the right in the photo above. I took this photo a couple of months ago at Gabriola’s Drumbeg Park, which is exposed to the Strait of Georgia and therefore gets more than its share of drift logs. The tides had been fairly high that week and a sizeable collection was already evident. But I’m guessing the pile will be much deeper by the end of this weekend, especially if we get strong winds along with those supermoon tides. 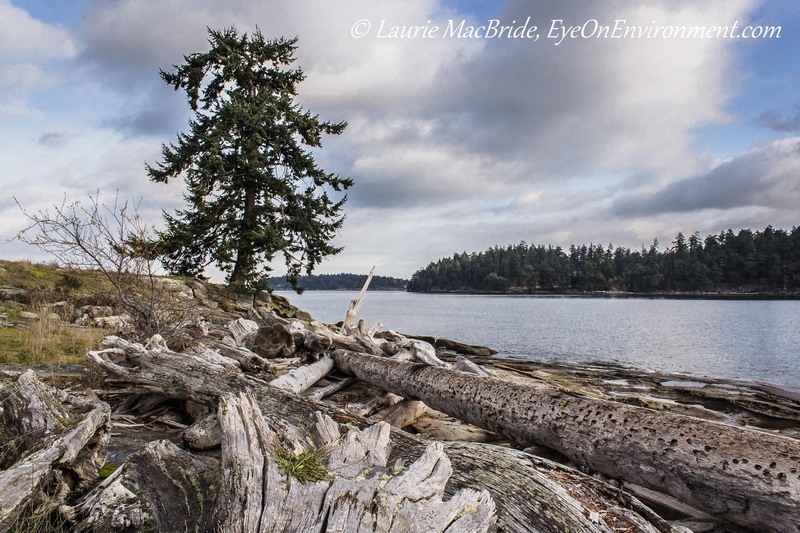 Posted by Laurie MacBride, Eye on Environment on January 29, 2014 in BC coast, Boating, Gulf Islands and tagged Drumbeg Park, forest industry, Gabriola, moon, ocean, photos, shoreline, supermoon, tides. The tides are sure high here! I am having trouble getting off the boat with my short legs! Beautiful shoreline image, Laurie. Thanks, Sherry. I can relate – my legs are short and our boat has a high freeboard … On some docks it’s a challenge! Wow I bet lots of people would pay good money for that driftwood. People used to cut it up for firewood but I don’t see so much of that these days – partly because such salty wood is hard on wood stoves and chimneys, and also because it contains dioxins. I guess there really is no free lunch!